I want to learn from past legends. I want to know how they battled through adversity; or how they reinvented the game. And how they conquered defying odds. In light of that, I’ve thought long and hard about putting together a Top 10 Must-Read List for Entrepreneurs. I’m providing you with a list of books that changed the way I think – books which guided and inspired me after various challenges in my entrepreneurial journey. After scouring through my library and the notes I’ve taken from virtually every book I’ve ever read, my list is complete. Roughly half of these books within my must-read list give you critical theoretical tactics and habits for entrepreneurial success. They provide the sort of nuts and bolts concepts to entrepreneurialism and teach you how to embrace the adventure it is. The other half are about success stories, both entrepreneurs and war time leaders. The individuals in these stories put a lot of the theoretical strategies and tactics, from the other books within my list, into practice on the battlefield and in the business world. I recommend purchasing every book on this list that you haven’t already read – they had career and life altering impacts on me. You can click on any of the book covers to purchase them from Amazon. This first book is by Jim Collins. It was published back in 2001, but the research and reasoning behind the lessons and ideas throughout the book are timeless and transformative. The book was groundbreaking at the turn of the century, and it is required reading in many of the good Business Schools today. At its core, Good to Great explains the duality of leadership. I am certain you’ve seen this book on many ‘must-read’ lists. And there is good reason for that. You may have already read it too, but for those who haven’t, now is the time. Habits define who you are. It is imperative you realize the daily habits which are holding you back from greatness. If you haven’t read this book by Stephen Covey, pick it up today. This book is by a Wellesley College history professor, Guy Maclean Rogers, who writes eloquently. The book is about Alexander the Great. If you are wondering why it’s on my entrepreneurs must-read list, then you need this book more than anyone else. Being an entrepreneur is about waging battles – not always with an enemy, but sometimes with your allies (challenging your employees and partners), and sometimes with yourself. This book chronicles the mind of tactical genius and there is more than just drama to be unfolded. Alexander was also the richest man in the world at the time of his rule. This is an old time favorite and has been required reading for virtually all military leaders of the Western World. From MacArthur to Napoleon to Donald Trump, Art of War has been read by some of the most iconic leaders we know. You need to read this book, cover to cover, and memorize the lessons on strategy. Unfortunately, the book’s wisdom is often lost in Hollywood misrepresentation. However, the more you read it, you begin to realize its relevance to being an entrepreneur. Once you internalize this book, you will find that strategy and timing works better than raw strength or force. It’s a timeless book that’s been read by some of the greatest leaders, both in the business world and military, ever known. With every page I turned in The Art of War, I couldn’t help but wonder what the likes of Patton and Churchill thought when they flipped the same page. This one is on the dry side of the fence for many of you, but it is something that you need to read. Michael Porter is the guru of competition and competitive forces. If you have the time, I also recommend reading his other books on competition and strategy. The goal when reading this book is to internalize the concept of competitive advantage and create value from the beginning. Big businesses use these strategies and there is no reason why a startup should not get on the same path. This is about the financier of financiers, JP Morgan himself; and it is written by one of the best biographers I know of, Ron Chernow. The book was published back in 1990, but I frequently reference the copy on my shelf for motivation. The House of Morgan will never go out of style. You need to understand the character of what it takes to make things happen on a grandiose scale. And JP Morgan personified that character. He trained himself to fear no one nor any challenge. When you want to learn, learn from the Greats. JP Morgan certainly fits that bill. Ron Chernow’s storytelling ability, while remaining acutely true to the facts, makes for an entertaining read. Another book by Ron Chernow. It illustrates a number of characteristics that a man/woman needs to be successful. Times may have changed, but success is still success regardless of whether it’s 1881 or the new millennium. The key is to read into how these men faced bitter forces and rose above. 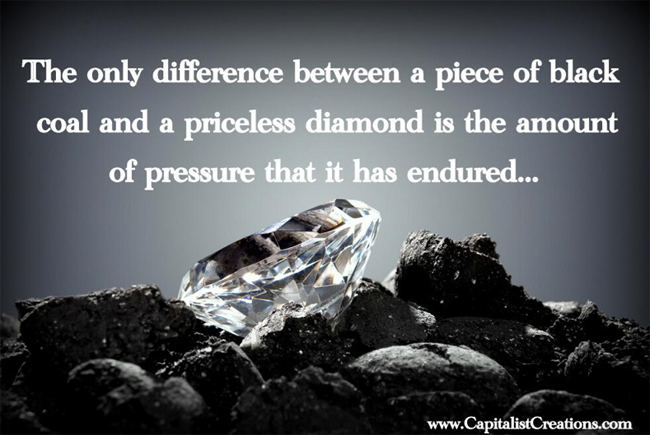 When pressure is applied, do you crumble to dust or become a diamond? Learn from the choices Rockefeller made in tumultuous times and you’ll realize why history still remembers who he was. This biography is by David Nasaw and it’s less than a decade old. It’s a long book, but it is an exhaustive and accurate account of the man and the legend who I’ve written about on Capitalist Creations before. From his early days and his propensity to save and work hard, there is nothing more inspiring than reading about one of America’s greatest industrialists and philanthropists, Andrew Carnegie. This is an autobiography of Henry Ford. He was a very unique individual. You will see that when you start reading this book. It takes a Mozart-like genius to come up with some of the things he did at a time when most people weren’t remotely open to new ideas. He started with a big audacious goal which nearly bankrupted him, but his deep desire to succeed forced him to deliver on it. His autobiography is a humble account of what success should look like. Of all the books I’ve read on great businessmen, this one by Walter Isaacson has to be the most relatable for entrepreneurs nowadays. We shared the same moment in time as he did. Unlike all the other notables, who went before me, this man grew right in front of us – from a young man with a dream, to a legend. This book is a wonderful read and it is a must for those who want to apply themselves, without hesitation, to the task of achieving. And there you have it – the ten must-read books for all entrepreneurs. Absorb the lessons in these pages as they will inspire and help you form a lifestyle conducive to wild success. You will take comfort, at least I did, in learning about how many of these individuals overcame daunting obstacles which would compel most to quit. After reading these books you’ll realize that it was the ability to overcome those obstacles which implanted these men in the history books.